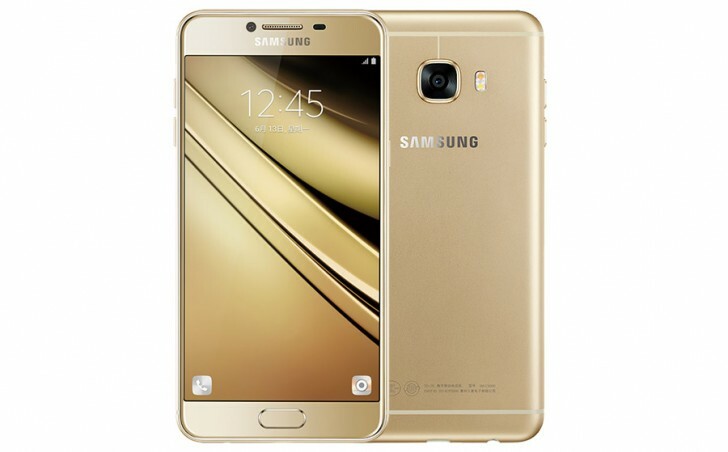 Following the Samsung Galaxy C5, the Galaxy C7 has been made official as well. The device is powered by Snapdragon 625 SoC with octa-core 2.0 GHz Cortex-A53 CPU and Adreno 506 GPU, and sports a 5.7 inch full HD display. The handset has 4GB RAM and comes in 32GB and 64GB expandable internal memory options. In terms of camera, the phone features a 16MP rear unit and an 8MP front shooter. A 3,300mAh battery (with Qualcomm Quick Charge 3.0 support) is there to keep the lights on. Measuring 156.6 x 77.2 x 6.7mm and weighing in at 165g, the Galaxy C7 runs Android 6.0.1 Marshmallow out-of-the-box and features a home button embedded fingerprint sensor. Connectivity options include Wi-Fi 802.11 a/b/g/n/ac, 4G LTE, GPS, Bluetooth v4.2, and NFC, while color options include silver, gray, gold, and rose gold. As for price, the 32GB variant carries a tag of RMB 2,599 (around $395), while the 64GB model costs RMB 2,799 (around $425). Availability details haven't been revealed yet. Whether 64 GB Galaxy C7 is going to be launched in the month of August, 2016 in India ? Samsung break your silence please.